Just over a year ago, WSU quarterback Tyler Hilinski passed away and the Hilinski’s Hope foundation began. Focusing on mental health awareness in student athletics, Hilinski’s Hope is continuing to make a difference. We caught up with Kym Hilinski to learn more about the recent progress of the foundation and the importance of Hilinski’s Hope in student athletics. Roughly 45 percent of school children in Washington state are designated as people “of color.” But there’s only about 10 percent diversity among teachers and school administrators. This isn’t a new problem. And universities are certainly not just now working on solutions. But thanks to being the first recipient of the George Brain and Gay Selby Faculty Award in Educational Leadership, WSU Vancouver's Katherine Rodela is working to bridge that diversity gap. A quartet of Washington State University students, led by team leader and sport management student Dante Ludlow, is soon taking their analytic prowess to a conference in Phoenix… a conference meant specifically for baseball analytics. While there, they’ll take part in a competition in front of baseball executives, with a dream of perhaps catching a few eyes and, even better, job offers. Individuals with Cerebral Palsy suffer from all kinds of effects such as issues with muscle tone, posture, bone growth, chronic fatigue, chronic pain, and so on. At Washington State University’s Bruya-Wood Undergraduate Research Conference, we spoke to Justin Harrer and Morgan Davis, two kinesiology students within the College of Education, about using aquatic intervention to enhance quality of life for those with Cerebral Palsy. WSU ROAR is designed for students with intellectual or developmental disabilities and it gives them a traditional, on-campus experience. One of the best things about ROAR, is that it not only has a positive effect on the students themselves, but through those students, a positive effect on those involved in any capacity with the program. Like WSU soccer player Maddy Haro. Over the last few years, researchers and scholars within Washington State University’s kinesiology programs have touted the benefits of exercise, both informally, and as part of the Exercise as Medicine initiative. At this year’s Bruya-Wood Undergraduate Research Conference, we caught up with student Jessica Krull, who goes into more detail about how exercise can actually help fight depression or depressive symptoms. There are currently three main treatment options for Parkinson’s disease, though the downside to them include harsh side effects, invasiveness, and high cost. We caught up with kinesiology student Collette Edge at the Bruya-Wood Undergraduate Research Conference, and she told us about one other treatment option: high-amplitude action-observation (HAOO) group fitness and how it can help decrease symptoms for moderate-level Parkinson’s disease progression. WSU College of Education professor Joy Egbert has received a Fulbright Specialist Award and in March will spend three weeks in Macedonia. It’s not the first time Joy has traveled abroad for Fulbright. Many years ago, she traveled to Russia. Since that time came more experience and more wisdom; an outlook that Joy recognizes will help her more on this trip. She talks to us about the impending travel, her theories on immersive language acquisition, the role of a mentor, and what makes her an #AgentOfChange… all while she’s on a sugar high. There are principals, and then there are principals-of-the-year principals. Valencia Toomer is the award-winning type! She’s a College of Education alumna, and we’re excited that she recently was honored in North Carolina for her excellence. We talk to her about the award, and how at the root of everything, she’s an agent of change by believing in helping the whole child. At Washington State University, one aspect of the Drive to 25 initiative is to increase enrollment of international students. To achieve this, WSU became one of 11 universities in the United States to partner with INTO. INTO is a private organization that partners with universities to connect potential students with opportunities in higher education. Chad Gotch is an assistant professor and the INTO coordinator for the Educational Psychology program and he spoke with us about the dynamics and impact of INTO. In rural Washington, there is a shortage in both the number and diversity of students who enter biomedical careers. Thanks to two Washington State University professors, and a 1.2 million dollar federal grant, the HEAL project aims to solve this issue. HEAL stands for Health Education through Arts-based Learning. The two faculty members, Molly Kelton from the College of Education, and Jeb Owen from CAHNRS, explain how HEAL can help build child interest in science, as well as provide a service to the medical community. Heidi Rhodes is the first graduate of Washington State University’s Mathematics and Science Education doctoral program. 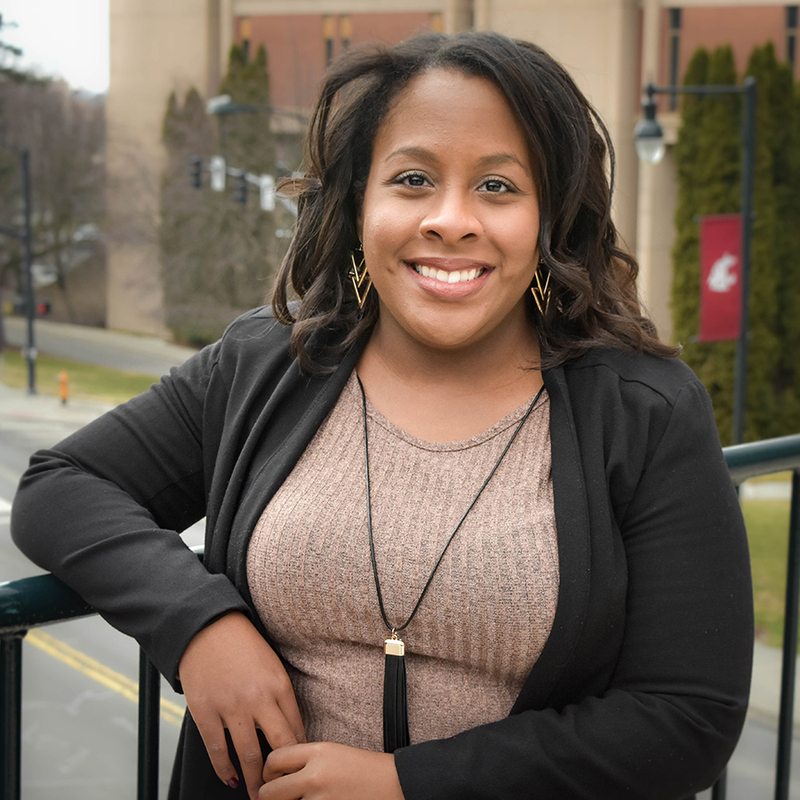 Rhodes has completed this program from WSU Vancouver and talks about the highs and lows of earning her Ph.D., as well as shares her research about middle school principals and their perceptions about math. Education Eclipse starts now. issue, WSU created a course, Mathematics 100, to strengthen students' basic math skills. Further analysis found that certain modifications to the online course are critical in order to produce successful results. Mathematics and Science Education doctoral student Candace Chapelle talks to us about her research, the results of which provide insight into the factors that aid student success with this course. Every once in awhile, we run into one of our graduates whose career is NOT in their field of study. We often find those stories to be every bit as interesting as others we share. Well, here’s the story of CJ Robert, who graduated from WSU with a Kinesiology degree and now owns TWO businesses. We sit down with CJ over lunch in the coffee shop she owns in downtown Pullman, and chat about why she’s doing what she’s doing, and some of the highlights – and struggles – of owning multiple businesses. Every year, a Washington State University College of Education student wins the Inga Kromann Book Award. Dr. Inga Kromann was the children’s literature professor at WSU for 38 years. She created an endowment to support a book contest, which was created by her successor, Associate Professor Jane Kelley. We’ve highlighted previous winners on our podcast, and continue that tradition with this year’s winner: Grace Ku. We let Grace tell us more about her book, and why she wanted to become a teacher in the first place. Washington State University’s Learning and Performance Research Center (LPRC) hosts its sixth annual Methods Workshop May 10-11, 2018. The LPRC isn't alone in its sponsorship. It's joined by the College of Education's Educational Psychology, CAHNRS’ Department of Human Development, and the College of Arts and Science’s Department of Psychology. There are multiple entities involved because of the importance of the workshop and its potential benefits. In preparation for this year's workshop, we take a look back at last year's. It is commonly agreed that practicum-based learning is essential for success in a variety of different careers. This is especially true for educators who already get great experience through this process. Yet, many preservice teachers feel unprepared to work with culturally- and linguistically-diverse students. Enter case-based instruction which assistant professor of educational psychology Kira Carbonneau says could give an authentic classroom-like experience to these preservice teachers. Every year, as part of the sport management program capstone, students split into small groups and put together a fundraiser. This requires them to use all the knowledge they’ve acquired during their time in the program. This includes all event planning, from logistics to promotion. One group ran the Palouse Mental Health Resource Fair over Mom’s Weekend, and it hauled in quite a bit. There’s a new program for students with intellectual and/or developmental disabilities. It’s called WSU ROAR. The WSU stands for Washington State University. ROAR stands for Responsibility, Opportunity, Advocacy, and Respect. If those also sound like VALUES, you may be right! We talk to co-founder Brenda Barrio about how WSU ROAR gives a college experience to students who may not otherwise have the opportunity. The current teaching shortage extends to individuals from Native or Tribal communities. Enter in Ti’Tooqan Cuukweneewit, a project from WSU’s College of Education that helps those in Tribal communities to take life experience and their already acquired Indigenous Knowledge Systems, and add to it the requisites needed to become fully certified by the state. With the help of two grants, renée holt and Francene Watson are working collaboratively with several groups, but in particular Tribal communities, to try and make a difference. Hannah Martian is a sophomore Sport Management major in the College of Education. She's from Arlington, WA and has a desire to one day become a baseball play-by-play broadcaster. In the meantime, she has recently filed to run for ASWSU Senator and represent the College of Education. Every year, a WSU student wins the Inga Kromann Book Award. We’ve highlighted previous winners on our podcast. The purpose of this award is to recognize the literary talents and efforts of the students. This year’s winner is Stephanie Sparks, with her book A Pencil Named Benson. She tells us more. Police dogs. Quite frankly, some police officers spend more time with their canine companions than they do with their own families, making those dogs de facto family. But how do we train police officers to render first aid to their dogs in emergencies, such as ingesting poisons? Phyllis Erdman is an expert in veterinary education, and talks about the unique bond between law enforcement canines and their handlers, as well as some new research she’s done. Quite simply, we can teach better, as a society, when we better know how students learn. A lot of research has been done through classroom observation. But getting down to learning from a neurocognitive perspective, can really help researchers better assess what works and what doesn’t. Jonah Firestone, from WSU Tri-Cities, tells us about a lab that can help do that, called the Simulation and Integrated Media for Instruction Assessment and Neurocognition Lab. We’ve all heard of “best practice” or “evidence-based practice.” Not all current teachers know what that best practice may be because they are uninformed about the newest research, or professional development hasn’t been provided to them. That certainly holds true for special education. We met up with Yu-Ju Hsiao from WSU Tri-Cities, and she goes over some of the latest evidence-based practices that exist in special education, specifically with students on the autism spectrum. For stage actors, it’s not just about what is said, but how it’s said. And the body language that is used. The same can be said for teachers. Educational psychology doctoral student David Alpizar talks about something called “signaling,” which can be a variety of ways to emphasize thing for students; to draw their attention. Specifically, how signaling can be effective in a multimedia classroom, where a lot of stimuli wrestle for the attention of students. During a teacher shortage, one place to look for teachers is the classroom itself. Washington state already has a lot of paraeducators… folks who are in the classroom day in and day out, and aren’t certified teachers for a variety of reasons. Lindsay Lightner is at WSU Tri-Cities, and introduces us to its Alternate Route program, which helps these parapros become certified teachers. Situational interest is something that teachers often have incredible ability to control, and it’s the ability to gain the attention and engage the students. At least that’s the really basic way to describe it. We caught up with Nathaniel Hunsu at this year’s WSU Academic Showcase at and talked to him about increasing or fostering more situational interest in an educational engineering classroom. People are bringing dogs into schools more than ever before. Usually, the reason deals with social aspects or social skills. Comfort dogs, for example. A lot of times, we call it canine therapy. But do we know the effect that dogs truly have on learning? Some research suggests there are some benefits to dogs in the classroom, especially for students with disabilities. That’s exactly what educational psychology doctoral student Katie Barton is trying to find out. Research has shown that small interactions between students during small group learning environments can help the overall achievement of that group. We talk to Josh Premo, a graduate student in the biological sciences, who is working collaboratively with science education faculty Andy Cavagnetto to determine if, in fact, small group interdependency during learning can be used to leverage increased behavioral engagement at the whole class level. How is autism normally portrayed in literature? And, is it done in a way that exacerbates misconceptions or misperceptions? Christina Brando-Subis is a Language, Literacy, and Technology doctoral student whose research shows how current award-winning literature portrays autism, and what the outcomes of that portrayal may currently be. Classroom technology integration has always been vital. So with every new building built, we must look at not only how to integrate current technology, but how to prepare for future technology, whatever that may be. That's no easy feat. Educational psychology doctoral student Kripa Sundar joined some of WSU's AMS experts to research active learning environments and how technology could best be implemented in WSU's new Digital Technology Classroom (expected Fall 2017). It’s the academic advisor who is on the ground floor and sees the student’s whole academic career pass. They’re there when the students start and when they graduate. They see the struggles. They see the triumphs. Dan Overbay is an academic advisor at WSU Vancouver. We talked to him about the differences between being a student in Vancouver, versus WSU in Pullman. We talk about first-gen students. And, should teachers make more money? We talk about STEM all the time. Since half of STEM is math and science, a doctoral program that has both of those aspects would be considered fairly important. WSU College of Education Mathematics and Science Education program is led by Dave Slavit, at WSU Vancouver, though the students are scattered all over the state. We talked briefly with Dr. Slavit, about what the current math and science landscape is in our country and why this program stands to make a huge difference for both the doctoral students themselves, as well as the individuals whom they do and will serve. On this edition of Education Eclipse, intern Brittni Willis sits down with Pullman Police officer Riley Myklebust. In addition to Officer Myklebust having been ASWSU president during his time as a student, he was actually a College of Education graduate. So how does a guy who is an elementary ed major become a cop? And, how did his schooling back then help him now? STEM stands for Science, Technology, Engineering, and Math. In a complex world, with complex societal grand challenges, it’s important for our nation’s youth to be equipped with the knowledge and skills to solve these tough challenges. Yet, how we teach these is also under the microscope then. STEM Education is a passion of Tamara Holmlund Nelson, a professor of science education on WSU’s Vancouver campus, and she explains what STEM ed is, along with some of the positive and negative issues surrounding it. Whenever you hear about a school turn-around, or an amazing reform effort, one of the indispensable components of these is a good principal. On the flip side, teacher retention is the worst in the first three years of a teacher’s career, and one of the most often cited reasons by these teachers for leaving the profession is a lack of support or understanding from the principal. We talked to Teena McDonald, clinical assistant professor of educational leadership, at WSU Spokane, about the college's top-notch principal certification program. Salina King is a recent graduate from the College of Education. You could say that she's doing a victory lap as she is using this Fall 2016 semester to finish her program and receive her teaching certification. She's student teaching in a 4th grade classroom in Colfax, WA. Washington State University’s College of Education has a dynamic statewide educational leadership program, including superintendent certification, principal certification, and the best, most well-respected educational doctorate program in the state. One of the college’s ed doctorate grads is Jared Hoadley, the executive director of student services for the Mead School District, north of Spokane. Using a balance of practical experience, theory, and research, Dr. Hoadley is a prime example of how our alumni are making a huge impact in the field. Right now, there’s a big focus at Washington State University on the health sciences. WSU Spokane has the new medical college, the College of Nursing, and the College of Pharmacy. However, only select populations tend to gravitate toward careers in the health sciences. Janet Frost is a clinical associate professor in the college’s mathematics education program, and the director of the Health Science STEM Education Research Center. Among other things, the center works on finding the best ways to help health science experts to better teach, mentor and guide these underrepresented students in a way that allows them to consider health sciences as a potential career. The Centers for Disease Control and Prevention states that one out of four older people, meaning 65 and older, falls every year, but less than half tell their doctor. One out of every five falls causes a serious injury such as broken bones or a head injury. There’s also a tremendous cost attached to falls. Dr. Robert Catena, from the college’s Sport Science program, is the director of the Gait and Posture Biomechanics Lab. And he says that while the CDC highlights older people falling, there’s another demographic whose falls can injury not just one person, but two, potentially more. We sat down with Shane McFarland, one of the college’s kinesiology graduate assistants, and talked to him about everything he’s been doing to help get this program off the ground. Imagine the difficulties of being a student in the U.S. while also being an immigrant. On the WSU Tri-Cities campus, associate professor Eric Johnson researches the difficulties, and talks about the engagement he does in this field that helps the students, as well as the teachers who teach those students. The WSU College of Education is a founding member of the Carnegie Project on the Education Doctorate (CPED), a consortium of 80 colleges and schools of education, all of whom have committed resources to work together and strengthen the educational doctorate. At this year’s annual convening, we caught up with educational leadership professor Rick Sawyer, from the WSU Vancouver campus, and he talked more about CPED and how the College of Education hopes to use its ed leadership program to advance WSU's mission and vision. If you hadn’t heard of augmented reality before, you probably have by now! That’s the technology behind the worldwide Pokémon GO craze. Special education professor Don McMahon tells us how augmented reality is being used in the college’s Assistive Technology Lab, and how that lab is helping increase opportunity and equity for students, especially those with disabilities. What good is student enrollment it if the retention rate is terrible. How can universities hang on to students they do have? WSU College of Education graduate Evelyn Martinez explains the importance of engagement, and students using the resources being made available to them. She also talks about universities having a more fluid definition of what success is. Some physical activity is better than no physical activity. But by combining scientific research with physical activity, we know how to make that exercise we DO do even more effective. Two undergraduate students earning their kinesiology degree have researched how resistance training can help people become better runners by improving something called “Running Economy.” They explain. Critical thinking is an essential skill for students to develop through their formal and informal education. The measurement of these skills is a challenge, especially with younger students. Several critical thinking assessments exist, yet their validity is in question. Educational Psychology doctoral student Latisha Sternod talks about her research in this arena, and gives implications for practice and future research. We caught up with Kiley Maag, a sport management student, and intern with the Houston Rockies. We talk to Kiley about her internship, and what she hopes for in the future. At the time of this recording, the Houston Rockets were in the first round of the playoffs against the Golden State Warriors.The Rockets would end up losing the series and be knocked out of the playoffs. Much of today's legislation demands educational success of all children, throughout the entire curriculum. There are certainly challenges with this, including the growing number of ELL students in Washington public schools. Two College of Education professors talk to us about their research, which aims to solve the problem, thus advancing opportunity and equity for all our state’s children. There have been almost 300 school shootings since Columbine, and the rate is increasing. When a school goes through something like this, how do the victims cope and recover? We spoke with doctoral candidate Patricia Maarhuis at the 2016 Academic Showcase about ways that schools, teachers, students, and communities can bounce back from devastation. From topics of racism to bigotry in our country, the International Globalization, Diversity, and Education Conference touches upon that which is part of the national dialogue. Conference chair A.G. Rud tells how this conference helps advance opportunity and equity. Chad Gotch is an educational psychologist working to bridge the gap between the test-makers and the test-takers. We talk with him about the educational video he's working on to accomplish that, the importance of classroom assessment, and how we can improve students' learning abilities. Every year, the Alhadeff Future Teachers of Color hosts a conference where experts in educational diversity and social justice speak. Cheyenne Cortesi is an AFTOC ambassador, and talks about the group, the conference, the importance of diversity in education, and why she herself wanted to be a teacher. Chris Connolly, assistant professor of kinesiology, explores the perceptions pregnant women have of exercising during pregnancy and explains the health benefits of doing so. Elias Whitefoot is not only a kinesiology student, he's one of the WSU College of Education's student ambassadors. He also comes from a long line of Cougs (fourth generation). We talk to him about why he chose his degree, what he plans to do next, and some personal stuff, as well. One WSU College of Education professor has said working is one of the primary ways we achieve economic and social mobility, doesn’t it stand to reason that the same holds true for those with disabilities? Marcus Poppen, clinical assistant professor in special education, has research identifying specific individual characteristics that can decrease the odds that an individual with a disability will obtain employment. Twice a year, undergraduates earning a kinesiology degree from Washington State University have the opportunity to present research findings to their peers, and the public. We talked with kinesiology instructor Kim Holmstrom, who is the conference co-chair. Richard Lamb is an assistant professor of science education technology. He's also the director of Washington State University's Neurocognition Science Lab and Data Center. He explains what that means and why it matters. Amy Roth McDuffie, the College of Education's new associate dean for research and external funding talk about why the college's annual new faculty writing retreat is so important for research and overall professional development. Meet the 2015 Inga Kromann Book Award winner, Sydney Freel, a junior pre-service teacher who won the annual honor (and $1,000) for her book Huckleberry Pie. She tells us what it's about and what inspired her to write it. While post-traumatic stress disorder (PTSD) has devastating effects on 5-17 percent of U.S. military veterans, those veterans who are Native American suffer PTSD at a much higher clip. One counseling Psychology Ph.D. student (and Native American veteran), Greg Urquhart shares his research on the subject. Send us a quick email. Keep it clean.